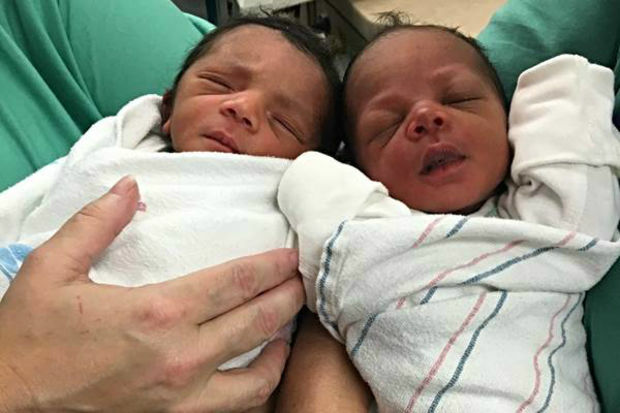 Twin girls born at the Roosevelt Red Line Station have been named Ja'miyla Giselle and Ju'niyla Brielle, according to a news release from Mercy Hospital. DOWNTOWN — The two twins born at the Roosevelt "L" stop on Wednesday morning officially have names. And, no, they're not Roosevelt and State. The girls — who were born as their mother tried to take a train to the hospital — have been named Ja'miyla Giselle and Ju'niyla Brielle, according to a news release from Mercy Hospital, which is treating the newborns and their mother. Ja'miyla is 4 pounds, 5 ounces, and is the older of the two, having been born at 7:30 a.m. Wednesday. Her fraternal twin, Ju'niyla, weighs 4 pounds, 6 ounces and was born at 7:41 a.m.
Their mom, who has asked to remain anonymous, was on her way to Mercy Hospital when she went into labor. Ja'miyla was born in the mezzanine of the Roosevelt Red Line Station before paramedics had arrived. Paramedics arrived to the scene for the second baby, giving their mother some privacy by holding up a garbage bag while she delivered the girl. The mother was calm throughout the birth, the paramedics noted. Afterward, the woman and her children were taken to Mercy Hospital. The hospital said the three are doing well.